Hi Friends! It's Rachel here with this week's Tuesday Tips and Tricks. Well it may only be August, but the holiday season will be here before you know it. It never fails every year I find myself with some last minute gift giving to do and even worse I also find I am short on cards. This year I found the perfect solution with these wonderful new 6x6 papers available at iCopic. Have you seen this wonderful line of 6x6 paper pads by First Edition? I immediately fell in love with them and wanted to create something with them right away. I was blown away not only with the quality of the paper but with the wonderful prints too. The Festive Treats Paper Pack Pad had me at Gingerbread, but it was this adorable single sheet of glittery patterned paper that first caught my eye. The sheet contained 4 single images that were easily cut down into 3"x3" squares leaving 4 perfect main images for card making. So today I am bringing you my trick for quick and easy card making featuring patterned papers. These cards came together so quickly I couldn't wait to share them with you. To get started I decided on a simple design and applied it to all 4 cards. I matted each 3" square piece of patterned paper with either a red or green cardstock mat. Then I cut a 4" square layering panel in the opposite color for each matted image and adhered the image to the panel with some adhesive. I loved the Homespun look of the images, so I embellished on the feel of the images by adding some stitching around them. I finished off the card by adding ribbon and adhering it to the card base with foam tape. So quick and easy! I hope you enjoyed today's feature and be sure to drop by the iCopic store to see the wonderful selection of patterned papers they carry. 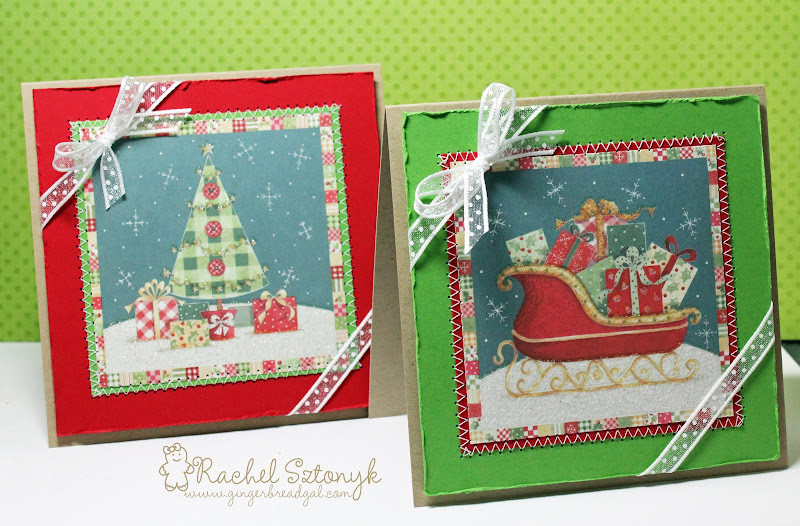 I am sure you will want to keep some on hand for your last minute card making. 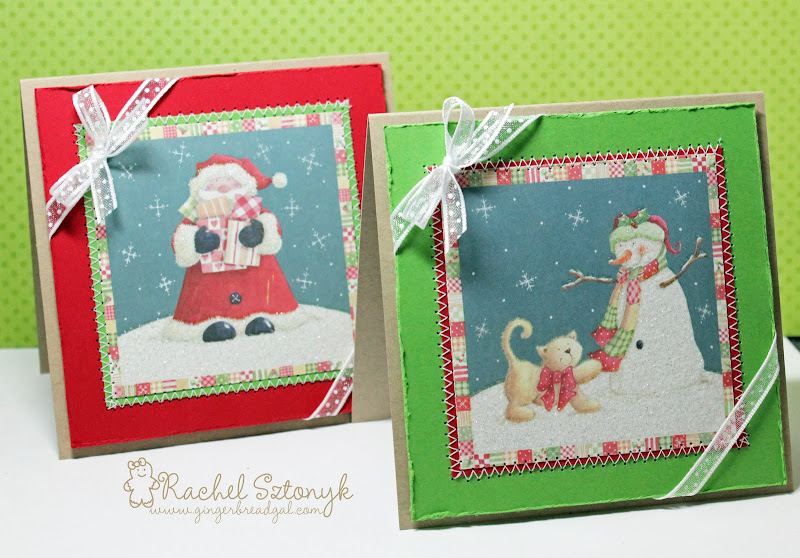 Such super cards with the patterned papers...all adorable! Fantastic cards! The stitching is the perfect accent!